The exterior of Citizens Bank Park, in South Philadelphia, at night. 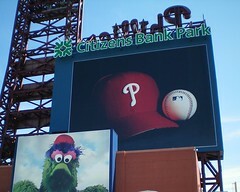 Pictured on the bottom left, is the Phillie Phanatic - the beloved mascot of the Philadelphia Phillies. Our SEPTA to Citizens Bank Park Guide - provides all the information you need on getting there via various SEPTA options, from any point in the region, and from out of town. If you're opting to drive to Citizens Bank Park, we've also assembled a Guide to Driving to Citizens Bank Park - which analyzes the several main options for driving to Citizens Bank Park, from the major interstate highways - I-95, I-76 (the Schuylkill Expressway), I-476 (The Blue Route), as well as via Broad Street. It is also helpful, if you will be traveling to Citizens Bank Park, from outside the Greater Philadelphia region. You can read our full-scale Harry the K's Restaurant Review - where you can enjoy sit-down service with great ambience - and without having to miss any of the action, as you're seated outside, with a protective roof, in the outfield. So you haven't been to a Phillies game, in a while. Perhaps you're an out-of-towner, who hasn't been here in several years. Or maybe you're too young to remember the old stadium. The Phillies played their Final Innings at Veterans Stadium - colloquially known, simply as "The Vet" - back in September 2003. Here's a summary of what's different, both good and bad, between the Phillies' new home, and the one they called home for 33 years. Capacity at Citizens Bank Park is about 45,000, compared to the 66,000 that the Vet could accommodate. This was done intentionally, to make the ballpark cozier and provide it with an early 20th-century ambience. 1) As noted above, the supply of tickets was drastically reduced by the smaller seating capacity. 2) The exponentially greater amenities of Citizens Bank Park increased demand among the fan base. 3) The Phillies improved on the field, as they are currently three-time defending NL East Champions, two-time National League champions, and the winners of the 2008 World Series. Naturally, this led to a resurgence of interest among the fan base. And while we're on the subject, have a look at our Phillies Tickets Guide - which lists all of the pricing options for single game tickets at Citizens Bank Park. Citizens Bank Park did not open until 2004, when most of the new, retro ballparks around Major League Baseball had already opened. One benefit of the relative slowness of the replacement of the Vet, was the fact that the Phillies had the opportunity to study what had worked in the other new parks, and also learn from any mistakes that they had made. As a result, we would argue that - from a fan perspective - the new Citizens Bank Park is on a par with any other in Major League Baseball. There is so much stuff to see and do in Citizens Bank Park, that you could be hopelessly oblivious, to the action taking place on the field - and still come away with the exhilaration of a fun day (or night) at the ballpark. Between Bull's BBQ in left field, Harry the K's restaurant, and McFadden's on the ground floor - and revamped concessions throughout the park - there is enough stuff to eat and drink there, to keep you busy throughout the game, just wandering around and trying things. This also means more protection during rain delays. At the Vet, you could flee the elements by ducking into the concourse, but there was only one place where you could sit down and eat or drink - Chickie and Pete's. And even outside of the formal options, there are far more alcoves and covered areas in the new park. The concourses were designed, so that fans waiting in line, at any of the aforementioned places, could see the game action while they waited. This is in marked contrast to the Vet, where you had to rely on TV monitors to see what you were missing. Unlike the restaurants, which at least offer sit-down service and are only somewhat overpriced, there is no doubt that the typical Citizens Bank Park concession stand is charging you far more than it should be. Our recommendation would be, rather than spending time and money at them, would be bringing your own food and drinks. You're permitted to bring in juice boxes, as they aren't cans or bottles, and you're better off drinking your Capri Sun lemonade packs that you've brought with you in your bag, than waiting in line to buy an overpriced lemonade. Funnel Cake is available in Ashburn Alley in center field, as well as behind Sections 106, 206, 233, and 328. Funnel cake originated in the Pennsylvania Dutch country of Lancaster County, west of Philadelphia, and is a popular, ubiquitous staple of carnivals, amusement parks, bingo, festivals, etc., throughout Greater Philadelphia. Funnel cake is extremely unhealthy for you, as it literally consists of twisted dough which the server plunges into a fryer until done, and then douses liberally with powdered sugar. That having been said, it is also delicious! Given that it's a genuine Philadelphia thing, we'd recommend that you try it, especially if you're not from the Philadelphia area. Aside from its exquisite gustatory virtues, the funnel cake is also a good deal, pricewise. Your $5.50 buys you a plate of funnel cake, which by Citizens Bank Park standards, isn't so bad. 1) If you don't like fried foods, don't eat funnel cake. It wouldn't be good. 2) Make sure that you eat your funnel cake, immediately after they hand it to you. Funnel cake cannot be eaten slowly, as the edges of the twisted dough grow crunchier with each passing minute. As a matter of fact, we would recommend that you not even bother taking your funnel cake back to your seat! Instead, take a couple of minutes, find one of the many convenient tables or railings found everywhere in Citizens Bank Park, and eat your funnel cake first. You'll be glad you did. And make sure you bring plenty of napkins; your hands will be greasy from the funnel cake, and there will be powdered sugar, everywhere. But it's totally worth it! Turkey Hill Ice Cream, like funnel cake, also originated in Pennsylvania Dutch country. The ice cream is delicious. At the Turkey Hill stand adjacent to Harry the K's Restaurant, Chocolate Peanut Butter pints are offered - an outstanding flavor. Although, obviously, a pint of ice cream at one sitting is almost as unhealthy as eating funnel cake, it is a tremendous buy, by ballpark standards. If you eat a pint of ice cream for $6, you won't be hungry for the rest of the day/night. Although it will eventually melt, of course, it does have the advantage, unlike funnel cake, that you can actually take your Turkey Hill ice cream back to your seat and savor it, throughout the game. And Turkey Hill Ice Cream is another local product, and so if you're from out of town, like funnel cake, it's worth trying.